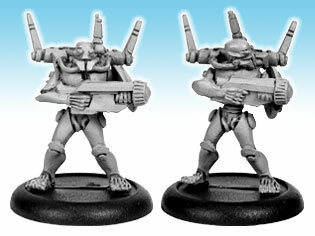 MKII Tactical Androsynths form the main part of the Syntha armed forces in Iskandria. 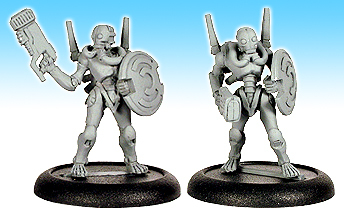 Artemis Class Biomechs usually lead them, with ‘Pointman’ Heavy Androsynths and Achilles Class Biomechs providing support. 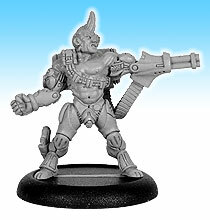 Though a new design the Syntha have already mass-produced their MKII Tactical Androsyths in large numbers, at least on Kyklops. They are the standard fighting unit of Prime’s forces on the planet. Somewhat lighter and more agile than their predecessors, this next generation of Androsynth possesses a far superior SPOMM guided path finding AI, better able to utilize and navigate the complex terrain of the urban environment. 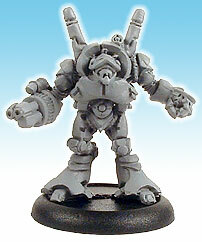 Androsynths armed with bulky plasma grenade launchers provide valuable mid range support capabilities to a strike force. Their weapons indirect fire and armour piercing qualities greatly enhance the overall performance of their unit. 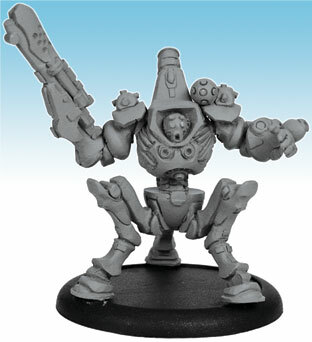 A radical new design best described as a Heavy Androsynth, the ‘Pointman,’ as they have been dubbed, represents a new approach to warfare by the Syntha. 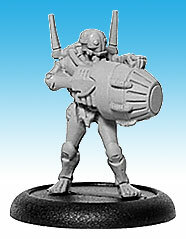 Heavily armed and armoured, the Pointman has been designed to spearhead the Syntha advance through the narrow confines of city streets. 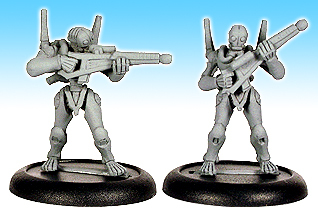 In addition to their firepower, each Pointman carries a sophisticated target location and relay suite used to communicate enemy positions to second line Syntha attackers. 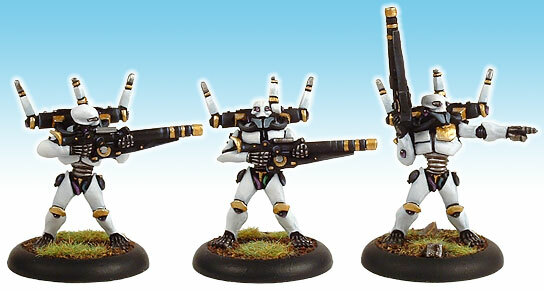 Like the new model androsynth, The MKII Tactical Teratosynth has been redesigned with urban warfare in mind. Boasting a high-mobility chassis and a new heavy-weapons suite, the MKII is a radical departure from its predecessor. The real innovation of the MKII family, however, is the next generation SPOMM path-finding AI that enables them to act with an unprecedented degree of tactical awareness, manoeuvring through tight spaces and intelligently utilizing cover as ably as any human soldier. The HK2800 model grav bike is a highly specialized weapons system, sporting an up-armoured carapace and increased firepower in the form of a pair of rotary-barrelled cannons. Sacrificing flat out speed for improved manoeuvrability, the HK2800 weaves through the complexities of the urban environment with unmatched agility. Perhaps its most innovative feature is its replacement of a human pilot with a grafted androsynth, blending bike and rider into a single, intelligent machine. 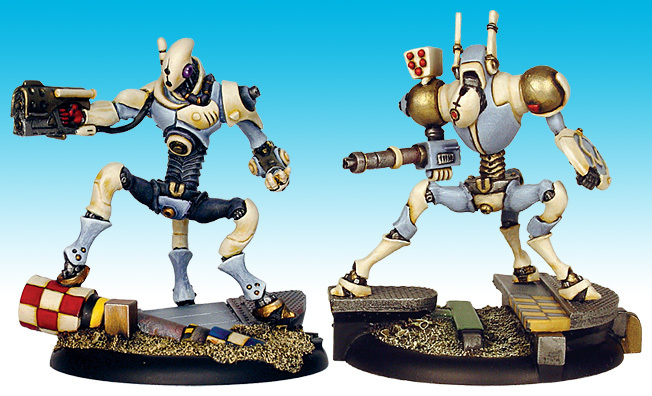 Long rumoured, the colossal Macrosynth walkers are finally a demonstrable reality. Planned in secret, built in violation of the Tripartite partition treaties, this enormous support platform is the bane of enemy battlesuits and bunkers, its powerful plasma cannon capable of demolishing entire buildings. 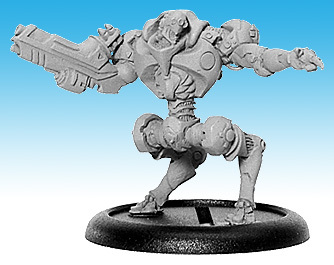 Like most walkers the Macrosynth can negotiate the uneven and cluttered terrain of the urban theatre of war, but its great weight and size make it slow. Despite its fearsome appearance it is a cumbersome close quarters combatant, designed instead to annihilate its enemies and long range. The Prometheus class M-Synth is a development of the original Macrosynth Heavy Walker. The emphasis of the new model is on anti-personnel ordinance. The two typical loadouts are the MLRS, focussed on long ranged support, and the plasma projector variant, designed for short range cleansing operations. The Syntha have made numerous breakthroughs in Biomech production in recent years, streamlining the process and greatly increasing its success rate. 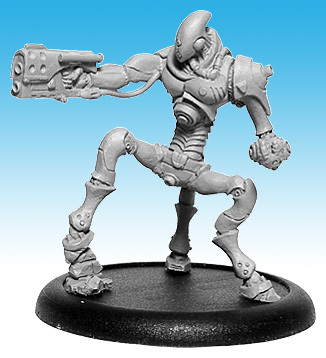 The Achilles Class Biomech represents this new breed, though somewhat less ‘perfect’ than the Biomechs of Xiao 3.14 Pi’s generation these heavily augmented cyborgs wield an impressive amount of firepower. 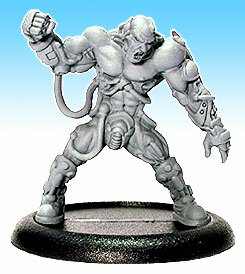 Like the Achilles, the Artemis is a new breed of Biomech recently perfected by the Syntha. 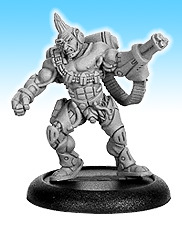 Lightly armed and armoured it is never the less a deadly opponent, possessing unparalleled speed through augmented reflexes and a mastery of urban warfare tactics through a combination of sophisticated neural implants and SPOMM-enhanced memory modules. 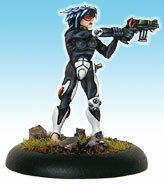 Designed to lead Syntha forces into battle, the Artemis Alphas are a cut above standard Biomechs, including state of the art multi-layered processing centers in addition to the standard host of tactical neural implants, the Artemis Class Alpha Biomech can instantaneously process the sensory relays from an entire company of SPOMM guided ‘synths and respond with appropriate instructions. 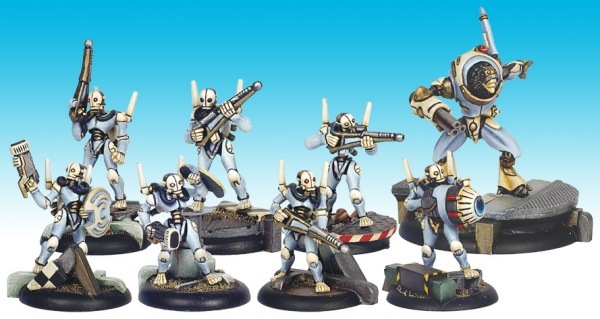 These are the next generation of “male” biomechs. The Hercules is a development of the Achilles class with improved muscle mass enhanced by new techniques in genetic manipulation. 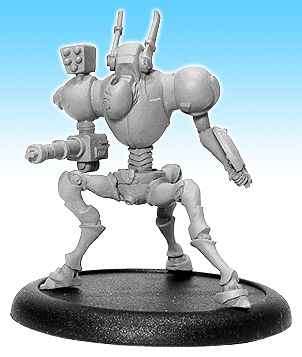 This chassis also benefits from a larger endoskeleton with refined hydraulics providing the biomech with the ability to puncture polysteel up to 25cm thick. 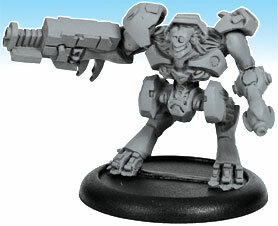 This makes the Hercules, nicked named the “Mauler” by the other homeworld forces, a ferocious hand-to-hand opponent capable of burrowing its way through buildings and destroying armoured vehicles and weapon platforms. 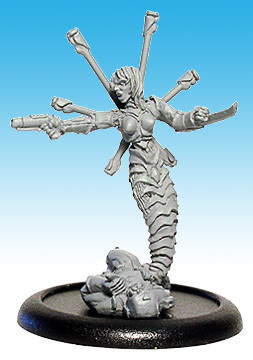 Strangest by far of the new class of cyber-augmented biomechs is the Medusa. 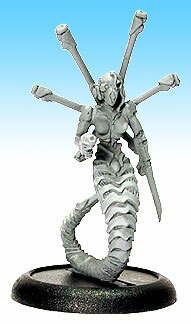 Alien in form, the Medusa is more machine than flesh, its human torso mounted atop an articulated tail like that of a snake. 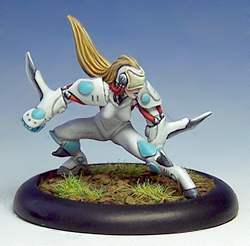 On the battlefield the Medusa is smoothly and eerily quiet as it swoops and leaps around the battlefield. 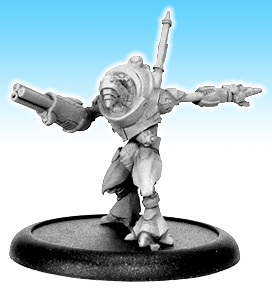 Suspended in a bubble of null-g provided by its gravpack, its bladed tail provides both balance and enhanced close combat capability. 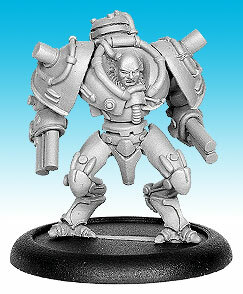 The next generation Syntha biomechs weld traditional biogenetic engineering with heavy cybernetic enhancements to create a breed of combat biomech created for specific battlefield roles. 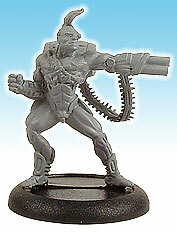 The Nyx class biomech is no exception, ultra-specialized and heavily augmented for its task of infiltration and assassination. 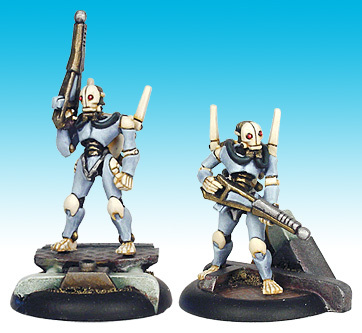 Programmed for stealth, and embedded with photo-mimetic light refracting cells that bend its image, the assassin easily slips unseen past enemy sentries until in threat range of its goal when, with preternatural speed and acrobatic grace, it rapidly closes the distance to the target over any terrain and kills in a blur of scything polysteel.